When it comes to buying a present, you can go crazy with so many options on the market, and fewer ideas for that perfect gift. Slippers can be an excellent choice, first of all, because they are practical. Everyone wears them around the house. Secondly, match these with something that is specific to the person in question, like a movie or a hobby, and you got it! Check out the selection showcased below to get an idea of what we mean. In case you are searching for something to warm your feet and make you feel cozy, you can try the fuzzy slippers designed with multi-colored faux fur from Steve Madden. The coat surrounds the upper part and sides of the enclosed shoes. Besides keeping your feet warm, they are really comfortable, featuring a soft, synthetic sole. What is better than coming home from a hard day’s work, throwing away your high heel shoes and getting your feet in these balls of coziness? You can also offer a pair of these slippers as a gift. Your friend will surely appreciate them. If you want a truly comfortable pair of slippers you can wear all day until you leave for work, and from the moment you come back home until you go to bed, we recommend purchasing the Haflinger Women’s AR Lizzy Slippers. These shoes are not just cozy and warm, but they also come with a funny animal design — one half on a slipper, the other half on the second one. They are also recommended for plantar fasciitis, as they feature a cork insole that conforms to your foot, and the wool lining is soft but also very breathable. As a genuine Stars Wars fan, these slippers are a must-have. Now that you know they exist, you really have no excuse for not purchasing them. And since we are on the subject, you can also get them for your avid fan friend as well. Made of 100% polyester fiber/polyurethane foam, with unisex sizing, they are comfortable and warm and come officially licensed as well. You can very well combine them with slippers featuring other Star Wars characters and replay the famous saga at home with your family. As our wise friend, Yoda would say — Try not! Do or do not, there is no try. You can surely leave your mark by completing your Halloween costume with these frighteningly realistic Billy-Bob Teeth Inc Zombie Feet sandals, which look worse than rotting flesh. This slip-on footwear is ideal for various occasions, from part of your costume accessories to home wear. They can also make an excellent gift for a zombie fan. One of the customers who reviewed this product mentioned that when he and his son, who are big The Walking Dead enthusiasts, watch the show, these slippers are also there every time. Finding a good pair of slippers can sometimes prove to be less easy. You might end up buying quite a few until you discover the right one for you. The UGG Women’s Andi Slippers seem to be a great deal. They are made of dyed lamb fur, featuring a synthetic, soft sole. The breathable upper and the suede outsole make them very comfortable. These ballerina style slippers also come with a Pom Pom decoration, making them look really cute. You also get a travel bag so you can take your favorite pair of homeware shoes anywhere you like. For Star Wars fans, who are also in search of a pair of slippers, Comic Images comes with this BB-8 model, which is bound to be a great success. They are made of polyester fabric and fiberfill, polyurethane and polyethylene foam. These scuff slippers feature anti-skid outer soles and cozy fleece insoles, making them really comfortable to wear. They are officially licensed as well. On a funny note, it is necessary to mention that they do not roll around like the cute Star Wars character, so you will have to take the steps needed to get where you want. Are you looking for baby girl clothes for your friend’s daughter? While you are on this, why not get a cute pair of slippers for the mother, as well? If she is a fan of the cartoon, the Disney Women’s Lilo and Stitch Slippers are ideal for the occasion. They are one hundred percent made out of polyester, with hand-made lining, and no closure, for easy putting on and taking off. Another convenient aspect is that you can effectively clean them using the washer. But the most significant feature is that these slippers will keep your feet warm and cozy all the time. If you are a woman who is into sweet, cute things, you will definitely love the Jacques Moret Women’s Critter Slippers. Made 100% from polyester, they are super soft and feature an adorable animal face theme. The slippers are designed with a pull on closure, and they can also be machine washed. This pair also comes with a non-slip outsole, offering safety when walking on any types of floors. Besides being reliable, they are also very comfortable around the house. These can make an excellent gift for anyone who is cuteness-addicted or they can be perfect for a pajama party. If you are out of funny gift ideas, search no more! 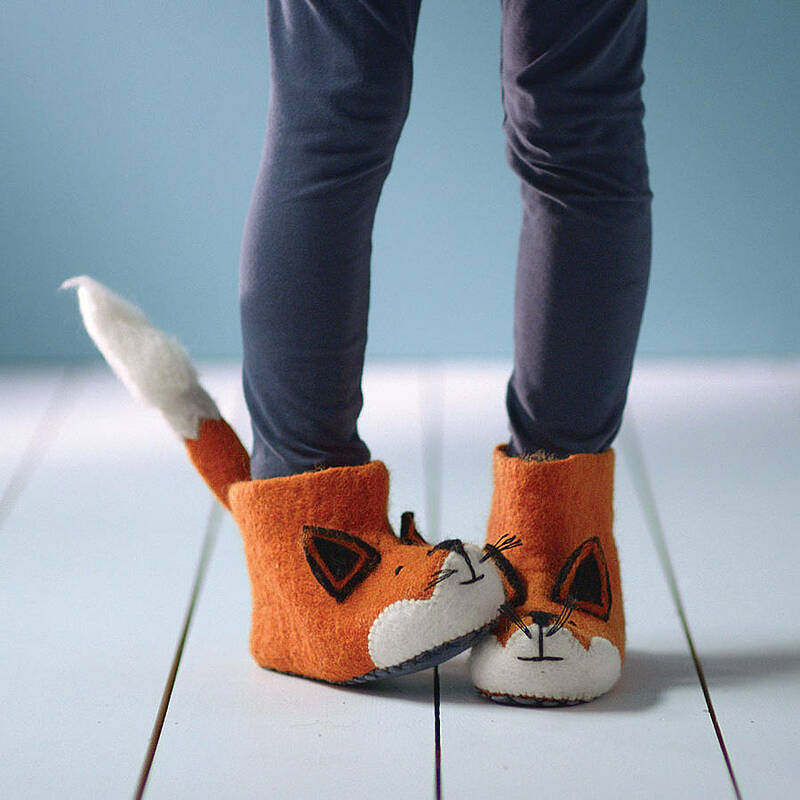 The ThinkGeek Furry Adventure Slippers can be exactly what you are looking for. Made from plush, once you put them on, your feet will turn into furry, yet adorable adventure feet. These are excellent for hanging around the house with a warm and cozy feeling, or for completing a furry adventure costume for a themed party, or for Halloween. Your feet will surely not go unnoticed with these slippers on. Regarding maintenance, it is not recommended washing them in the machine; use a damp cloth instead. You’d expect that finding the right pair of slippers would be an easy task since they’re not exactly pretentious footwear. Yeah, right! Maybe under Communism, where you get a regulation pair of slippers supplied by the state (we suspect). But with a free market, there’s always a wealth of models to choose from, even when it comes to something as apparently trivial as a pair of slippers. This can make even the most decisive of minds waver between apparently equally worthwhile choices. “Should I go for the traditional bunny model or dare for a novelty “bigfoot” slipper?”; “A full slipper or something more open?”; “Plastic, fabric, or pretentious leather?”; “What type of slippers will impress my crush?” These are just some of the questions that go through the modern slipper buyer’s mind, and there are of course a whole lot of things most of us never even consider when browsing what’s for sale. Some of these can be crucially important and can make the difference between an awesome slipper experience and a trip to the ER. This is why we compiled a list of things to be mindful of when purchasing your next pair of slippers. This is unquestionably the most important aspect that one has to have in mind, but sadly one that many prospective buyers chose to ignore. It’s quite a well-known piece of trivia that most accidents happen at home, predominantly around the areas of the house where we tend to wear our slippers the most, namely the bathroom and the kitchen. Stone tiled floors are famously slippery when wet, and they tend to get wet quite a lot. We should hence look for slippers that provide optimum traction, so we don’t lose our footing as easily. Most slippers have a flat sole, which provides very poor grip. But some items can have shallow striations, as pronounced as the thickness of the sole would allow. While not exactly climbing boot worthy, these are better than nothing, and we recommend you consider them while purchasing. The material of the sole has a more significant impact on traction. Plastic, especially harder plastic, is pretty bad at preventing your foot from veering off, but hard foam can handle a little better, and rubber is especially good at adhering to slick surfaces. It can be responsible for some very annoying sounds in contact with a polished stone floor, especially when new, but we recommend you simply ignore this for the sake of safety. There’s also a plethora of fire hazards in a kitchen, and slippers should be chosen accordingly. Any plastic material tends to melt rather than burn, which makes for okay fire resistance, but something like a cigarette ember can simply melt through soft plastic and get to the foot underneath. Natural textiles and rubber fare a lot better, but these are harder to find. Crushing resistance is not something we immediately associate with fluffy footwear, but plastic fur imitation can save you a lot of pain by cushioning the impact of hard objects you might happen to drop. A slipper’s main function is to keep your feet warm, both by providing insulation and preventing them from touching the cold floor. You should consider how cold does your house really get and shop accordingly. Particularly fluffy slippers, especially those with some novelty design that uses a lot of material might prove too warm and make your feet sweat. While equally comfortable, thin textile ones can provide for a little warmth. See how well the fit, and how much they “give in” while walking. Very loose fitting slippers with a heavy sole tend to flip flop a lot and can be responsible for some very annoying “clap” noises when the part directly underneath your heel touches the floor. Closed slippers or sandal slippers are ideal for wearing but can sometimes prove too warm, while more open slippers that are ideal during summer months can cause blisters at the root of your toes, especially if made of a rubbery material. If you can’t try them out, best you look for a sandal design for the latter. What are some cool things? Flames, race-car stripes, motorbikes, jet fighters, etc. 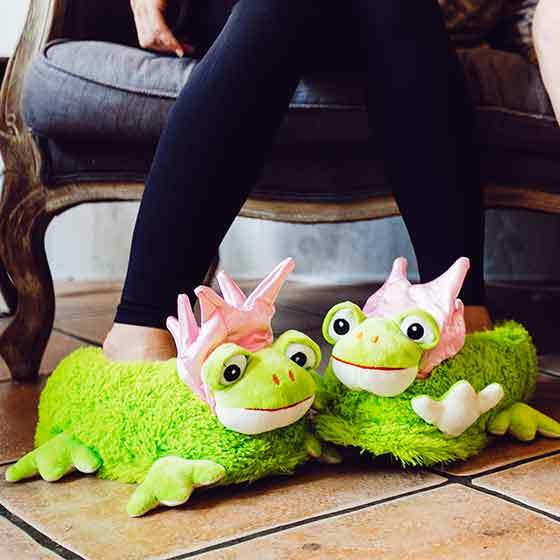 Some of those are admittedly hard to incorporate as themes for footwear design, but that doesn’t stop novelty slipper manufacturers to come up with all sorts of imaginative ideas. You can get a wide variety of plushy footwear in any form, from wolves, puppies, and elephants, to zombies and the already ubiquitous bunnies to wear both ironically and unironically. Be warned, however, that most jokes concerning obvious juxtapositions such as between bunny slippers and slovenly middle aged men had already been made, so only go for them at the risk of appearing unoriginal. Even some particularly high-quality grandfather slippers or Prince Alberts might prove cool for guys by giving a bit of lordly prestige when associated with the proper robe. What you have to take care for in this case is not to appear like a copycat of some later day ridiculous YouTubers, so definitely avoid this look if you have to try too hard at it. Cutesy fluffy animal designs might make for some cool slippers for the ladies under a certain age, and complete an otherwise adorable look. For the more serious minded, there are a lot of slipper designs, some of them even high heeled, that add a plus of distinction and elegance by looking very similar to a shoe. There are manufacturers out there that allow for anyone to customize their slippers with an image of their choice. Much like T-shirts, these can become either the most awesome slippers for adults or a testament to the user’s lack of imagination. You can decorate them with pictures of friends or family members, use them to make witty jokes or even political statements. A somewhat courageous company was producing Sarah Palin themed Chuck Taylors a while back. Why not go for some Ann Coulter slippers to make your liberal acquaintances fume?